The ultimate survival guide for study abroad students. Studying abroad is arguably one of the best decisions any student can make for themselves. A semester in a foreign country filled with exciting experiences, new friends and travel opportunities galore gives you a chance to broaden your horizons and enjoy the wonders of the world in some of your most defining years. We’re smiling just thinking about it. And while excitement is generally the overwhelming emotion for students about to embark on their journey, there are naturally some lingering nerves. Much of this can be attributed to the unknown. Living in a new country presents a whole lot of questions. How much money should I have on me? The good news is, we’ve had our fair share of experience in this space. Cohort Go has helped over 80,000 students across upwards of 180 countries with more than 60 currencies. 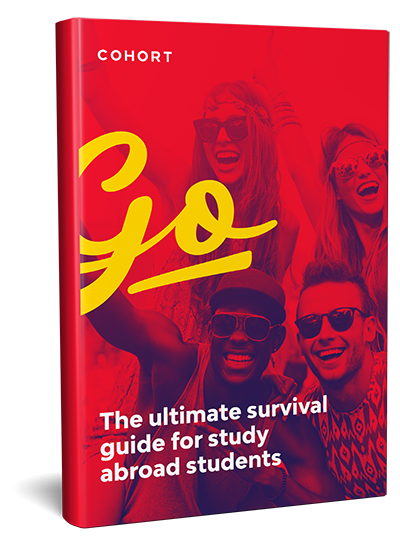 We’ve used our experience to build the ultimate survival guide for study abroad students. In this handbook, you’ll find everything you wanted to know and more pre-trip preparation to what to do when you first arrive. Let’s get your international study experience off to a flying start.